Both are the fruit of Marco Mancuso’s research on the contemporary Audiovisual Art/Science, which started in 2008 with the essay written for Bruce Sterling’s Fabrica Workshop, continued with the lecture taken at Museo della Scienza in Naples in 2009 and fixed with the curatorship at Sincronie Festival 2009. The Hidden Worlds screening, curated by Marco Mancuso, produces works that induce into a critical reflection on the existing relation between audiovisual contemporary artistic research (as regards to cinema, video and digital experiences) and applied sciences. This project, dealing with different artistic examples which investigate new expressive forms for the representation of the sound-image relation, deliberately avoids focusing on the existing common aesthetics among them, as well as on a possible expressive language. It rather suggests an overview on specific systems for sensorial perception, and emotional mechanisms of “saturation”, achieved through the use of hybrid techniques, that today like never before expand the tradition of analog experimental cinema and digital audiovisuals. The video screening takes the spectators to wonderful “hidden worlds”, illustrated by artists and scientists who, more and more often, collaborate and share experiences with one another on the research of new expressive potentialities within specific mathematical processes and physical, optical, chemical and electro-magnetic phenomena. By watching the audiovisual representation of the existing energetic and electromagnetic phenomena on the Sun’s surface and of current interferences generated from interaction of electromagnetic fields between the Sun and Earth, as possible instrument of aestheticization of the space phenomena by the Semiconductor duo (in works such as Black Rain and Brilliant Noise), the passage to the audiovisual representation of chemical-physical-optical reactions of Evelina Domnitch & Dmitri Gelfand, is extraordinary short indeed. In their first work present in this exhibition, (Camera Lucida) they study the chemical-physical phenomena of “sonoluminescence”, while in their second one (10000 Peackcock Feathers in Foaming Acid) they analyze the potentialities of optical phenomena generated by investigating the laser light within the nanometric structures of foams. Moreover, if the work on “chemical grams” by the video maker Jurgen Reble (Materia Obscura) underlines the structures born out of a film’s chemical corrosion, in the same way the first work by Thorsten Fliesch present in the exhibition (Energie!) shows the scorches on photographic paper produced by an high potential energy flow of an electron beam contained in a cathode ray tube. The number is also an ever present concept, being the fundamental element of every mathematical formula which involves not only a single phenomenon present in nature, but also “superimposed” interferences, beats, accumulations, harmonies and other optical event, like Moirè’s (optical illusion created by geometrical sequences of interference phenomena), as shown by the purely glitch and software works by Carsten Nicolai (Spray). The number, in its highest abstraction of key element for a fourth dimension representation , is an important part of Thorsten Fleisch‘s video (Gestalt), a recognition of the quaternion worlds (four-dimensional fractals) visualized in a three dimensional space through an appropriate software. 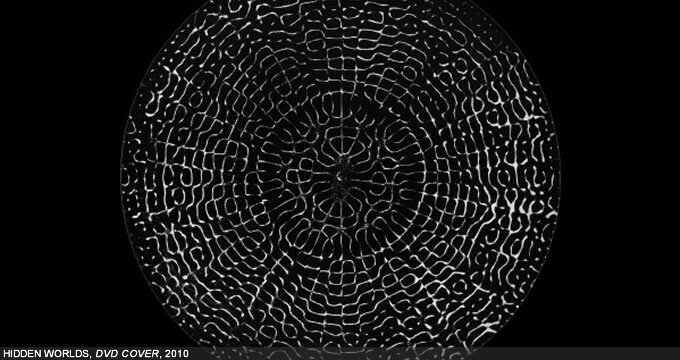 Yet maybe John Campbell‘s masterpiece (LI: The Patterns of Nature) is the work that mostly evidences the geometric structures spontaneously present in Nature, through a kind of magical and hypnotic audiovisual document.